Yes. It is true. It’s all true. I am one of those complicated people. The ones that are so twisted, that make you wonder why you still talk to them. I am one of the girls that make you regret meeting me at the first place, and then again, feeling like you’re the luckiest person on Earth because of having me in your life. I am also half hope. After I met you, that is. When I realized what you mean to me. I don’t lie now. Not you.Never. I couldn’t do that again. Can’t bear with your eyes full of tears and disappointment. Can’t bear with you telling me how I don’t deserve to have a child. Can’t see how sad I make you, when I know you love me for who I am. And for who I was. I don’t even care for the others now, baby. Because you knew me. When I was half agony, and when I was half hope. And you loved me, every step of my way. Of our way. I don’t want to lie anymore. You know I don’t want that. And you know there’s hope. There is hope for me. For you. For both of us. Have You Been To North Dakota? Today, I received a card, and I spent some time looking at this house. It is just perfect. I wish I could visit it, and I regret not travelling to North Dakota. When I have the chance, I’ll definitely go, and I’ll try to find this house! I am sad though, because I don’t know who sent me this card. It is from Reddit, but it just haunts me. Well, whoever you are out there, I hope you’ll see this post and read how thankful I am for receiving this card. It made me wonder who lived in this house, and if there are any people inside, living, even though to me it looks deserted and abandoned. I just hope you’ll see how much I appreciate your card. Hello guys! Today someone surprised me with Morph. Do you guys remember him? Morph is an amazing animation that started in 1977 in the UK. This card comes from there too. He is 12cm tall and he is always made from a lump of clay. He has his own YouTube Channel and even 38 years later, you can still watch him there. Here is a video of him, to remind all of us about this adorable creature, that we all love. I wanted to show you one of the handmade cards I’ve done recently. 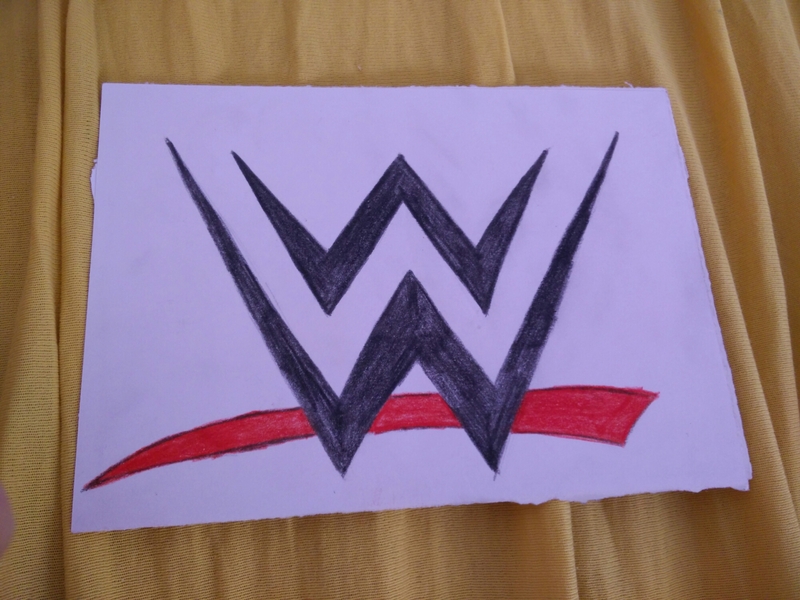 It’s the WWE logo, because one of the people I did a swap with requested it from me. What do you think about this? Do you like the postcard? This is one of the most beautiful places in the US, with waterfalls, lakes, rivers and plenty of big mountains to climb. One of the two major waterways in the Park is the Merced River, which carries rainwater and snow melt from the high Sierras and drains the southern part of the Park. How can you not love this view! Just look at the postcard I got. It’s so incredible. It’s heaven, you’ll have to agree with me. Just imaging the wind blowing and the sounds on the river around you, some animals passing by, and the sound of trees waving. It is a paradise for the soul, and I wish I was there to really feel it. Thank you /u/coolcatjames, for the amazing postcard from Yosemite! I love it!